Coffe Fact of the Week: Flat White, a photo by Knot Pretzels on Flickr. 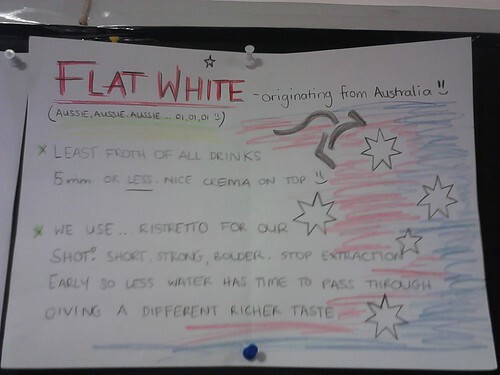 This week’s fun fact from Stef is all about the Flat White. Originating in Australia, the flat white is coffee for people who seriously need some strong espresso (with a bit of milk, of course!). We’ve had a few questions about flat whites in the mornings this week; if you’re looking for a short and strong caffeine boost on your morning commute, flat whites are for you!